Catheters are an important part of medical care in modern times, and an important part of many surgeries and post-surgery therapies. Catheter tips are an important part of the catheter as different uses require different catheter tips. There are a number of catheter tips out of which the straight tip and the coude tip catheter are two of the main types. Coude catheters or curved tip catheters are just like the straight tip catheters, but the tip is curved inwards. In French Coude means bend or elbow. Coude tip catheters have a curved tip and they are usually prescribed when a patient has conditions that can make inserting a straight tip catheter difficult. The curved coude catheter can navigate more easily past tight spots, common in the male with enlarged prostate, or strictures along the urethra. A curved tip makes it easier to navigate the catheter past tight spots, strictures, or an enlarged prostate. A pre-lubricated catheter makes it easier and faster to use. It lessens the risk of the recurrence of urinary tract infections. There are offset eyes that are located near the tip of the catheter, which provide drainage from two points within the bladder. The catheter bag protects the sterility of the tube and collects the urine. Initially, catheters are inserted by doctors or nurses, but afterwards it is usually the user themselves or the caregiver that takes care of the process of catheterization. What are My Options for Coude Tip Catheters? 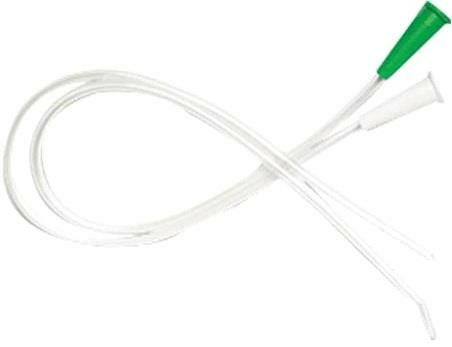 We have a wide range of coude tip catheters. It is used for intermittent self catheterization. This sterile urethral catheter is made of clear latex-free PVC material. It is comfortable and easy to use with no latex allergy concerns. It has raised indicator to identify direction of coude tip. It features coude olive tip with two staggered drainage eyes to provide for higher drainage flow. This 16-inch long catheter is for single use and sterile. It helps to provide users with the right balance of ease of use and protection, thanks to its unique design and exceptional features. Protective Tip helps to protect the catheter tip from exposure to bacteria in the urethral opening and helps reduce the risk of carrying bacteria up into the urinary system. Protective Sleeve makes the catheter easy to grip and easy to use and provides an environmental barrier to the catheter to promote easy handling while also helping to keep bacteria away. It is a pre-hydrated and ready to use catheter. Since it is pre-lubricated, the coating is always optimally hydrated to be extremely slippery and extremely comfortable. This intermittent catheter is a safe, hygienic catheter that offers ease of use, greater comfort and minimal risk of urethral micro-trauma for all catheter users.